Available from Wednesday 25 October, 2000 at 10:00am. This is the only place where their dancing and music are created. This is the only place where you can encounter them. High-caliber Dancers and Powerful Band Performing Live. Saburo Teshigawara, who is active worldwide, will finally appear at the New National Theatre, Tokyo. 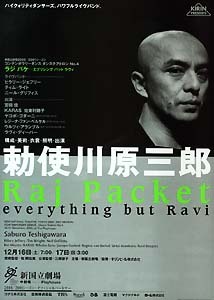 "Raj Packet - everything but Ravi" is the long-awaited new work in which he will make his appearance on stage together with guest dancers and musicians invited from Europe. Saburo Teshigawara is a dancer, choreographer, and stage director who attracts the greatest public attention in the world today. He formed the KARAS Company in 1985. Since then, together with his own company, he has been invited to perform at theaters in major European cities and international art festivals each year. He has also undertaken joint productions in Europe, tremendously influencing the dancing and theatrical circles there. "Absolute Zero" and the European tour in 2000 of "Light behind Light", which was created in Stockholm, won the highest praise and support for his finely honed aesthetic sense and unsurpassed dancing. He created works that became part of the repertoire of the Frankfurt Ballet, Netherlands Dance Theater I, and Bayerische Staatsoper Ballet. He has been asked by many overseas ballet and dance companies to choreograph ballets and dances to be performed next year or thereafter. In addition, he is highly rated worldwide for his broad range of activities and a high level of stage representation as exemplified by his excellent collaborations with musicians and visual artists as well as his efforts for educational projects targeted at youths in the United Kingdom.